Listening solely to LP, we began with Reference Recordings’ issue of the Chicago Pro Musica performing Stravinsky’s L’Histoire du Soldat. Contrasting colors were satisfying, and the soundstaging impressive indeed. I loved the beautiful pastels in the woodwinds, the convincing ring of the triangle, and the inherent balance of the presentation. Soundstaging was equally impressive on a cut by Muddy Waters and a brief listen to Stravinsky’s Firebird. Depth was superb. 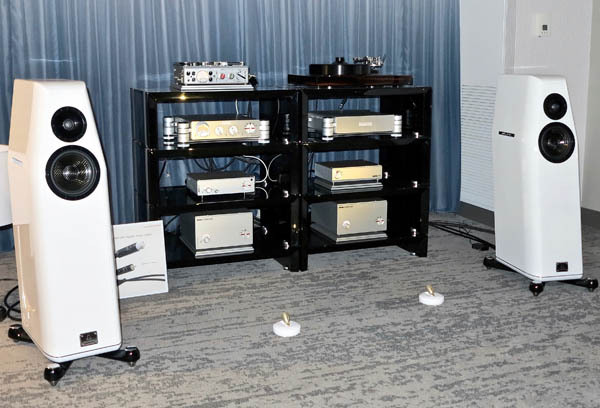 The electronics to thank were from Nagra: the HD preamp ($65,950), Tube DAC w/Classic PSU ($39,500) VPS phono preamplifier ($8750), two Classic Amps ($31,995 total), unheard Seven Recorder ($5500), and a NFS IV-S/QGB open reel. Damn, I wish I’d had more time so I could have listened to some tape.